Whether you need garden soil, lawn soil, special blends or mixes, Less Mess is the ultimate topsoil, mulch, compost, sand and stone delivery solution for less-mess outdoor landscaping and gardening, available in the GTA and London areas. Rather than have your soil delivery shipment dumped on your front lawn or driveway, leaving a mess that you have to clean up, Less Mess is delivered in pre-packed resealable bags that let you use just the amount of soil you need and set the rest aside for future use. 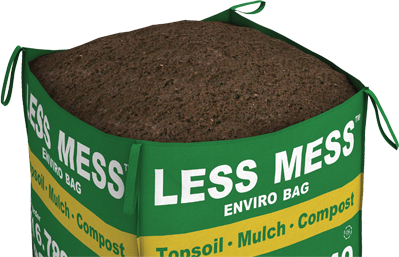 Less Mess soils are Earthco Soils custom topsoil, mulch and compost blends that offer nutrient-rich fertile organic growth environments for your garden. Each bag contains over 1 cubic yard (36" x 36" x 36") of quality garden soil, and the soil is delivered right where you need it. You don't even need to be home – simply mark the desired drop-off area with an "X" and we will leave the soil there for you on your desired date. Topsoil, mulch, compost, sand, and stone delivery hours are 8:00AM – 8:00PM Monday to Saturday, and 8:00AM – 6:00PM on Sunday in the areas listed below.